Did Jesus Predict the End of Time, or The Time of the End? First of all, let me apologize for the site issues. We were hacked– majorly!– and it has taken an inordinate amount of time to get the site restored. Thanks for coming back and visiting us again! Be sure to read installment #1, #2, #3 of this series to grasp the context and the importance of what we are sharing. The coming of the Lord at the harvest / resurrection at the end of the age in Matthew 13:39-43 is the end of the age resurrection foretold by Daniel 12:2-3. (The distinctive Greek term rendered “end of the age” sunteleia aionos in Matthew 13:40 is the same term the disciples used when they inquired of the end of the age in Matthew 24:3. See my Into All the World Then Comes The End for a full discussion of this distinctive term). 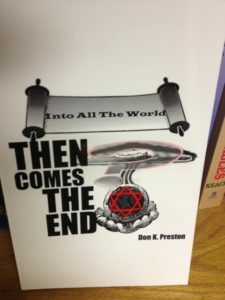 This book details at length what “the end of the age” truly means in scripture, and it is not what you think!! But, the end of the age resurrection foretold by Daniel 12:2-3 would take place “When the power of the holy people is completely shattered” (Daniel 12:7). So, what we have is that Jesus told a parable about the kingdom, the judgment, the end of the age. His parable is based squarely on Daniel 12 which foretold the fulfillment of these things when Israel would be completely shattered. Do you grasp how significant this question and this context is? This is a critical question for it has a direct bearing on our understanding of the eschatology of Jesus and particularly Matthew 24. Remember, Matthew 13 and Matthew 24 are about the end of the age. The identical distinctive Greek term is used in both texts. Both passages speak of the gathering (Daniel 12:3; Matthew 24:31). Both passages are dealing with God’s promises to Israel and the fate of Israel. Daniel 12 emphatically and irrefutably posits the kingdom, the gathering, the resurrection / harvest at the time of Israel’s destruction. Jesus directly alludes (some say he is loosely quoting Daniel 12:3, and in the normal custom of citations in the first century, this is true). Jesus then asked the disciples if they understood what he had said, and they affirmed that they did! Now, did the disciples know that Daniel 12 foretold the time of the end, the end of the age? Who can deny that? Did they understand that Daniel foretold the resurrection? It can hardly be missed. Did they comprehend that there was a direct connection between the end of the age, the kingdom, the resurrection, and the destruction of Israel, as Daniel so clearly states? Well, they said they understood what Jesus was saying! And Jesus was citing Daniel’s prophecy of the end, the resurrection and the destruction of Israel. If the end of the age in Matthew 13 is the end of the age in Daniel 12, then the end of the age in Matthew 13 would be when Israel was shattered. If the end of the age in Matthew 13 is the end of the age in Matthew 24, then the end of the age of Matthew 24 would be when Israel was shattered. The disciples said they understood what Jesus said about the end of the age in Matthew 13. But Jesus’ discourse in Matthew 13 is drawn from Daniel 12 which predicted the end of the age when Israel was shattered. Therefore, unless the disciples lied about understanding Jesus’ discourse about the end of the age in Matthew 13– and its undeniable connection to Daniel 12– then unless it can be definitively proven that they did in fact not understand what Jesus said in Matthew 13, it is prima facie evident that the disciples were not confused to connect the destruction of the Temple with the end of the age! Did the disciples lie in Matthew 13 when they said they understood Jesus’ appeal to Daniel about the end of the age? Did the disciples forget what Jesus said in Matthew 13 when they asked their questions in Matthew 24? Even if they had somehow forgotten it, that does not invalidate the actual connection between the end of the age and the destruction of Israel found in Daniel / Matthew 13! Did the disciples misapply Jesus’ application of Daniel, in Matthew 13? What is the proof of that? Daniel and Matthew 13 are predictive of the end of Israel’s age at the time of her destruction. The end of that age at the destruction of Jerusalem and the Temple is what prompted the disciples’ questions in Matthew 24. So, where would the misapplication and misunderstanding be? Did the disciples not understand what Jesus said in Matthew 16:27-28? Was the disciples’ understanding of Jesus’ teaching worse than that of the Pharisees in Matthew 21, so much so that although the Pharisees understood that Jesus was speaking of their impending judgment at the coming of the Lord, the disciples just did not get it? Did the disciples not comprehend Jesus’ emphatic declaration of the coming judgment of the city that had killed the prophets? Just how dense were Jesus’ disciples, if the modern day assumptions are correct? The undeniable fact is that neither Daniel, or Jesus spoke of the end of time. They spoke of the time of the end, the end of the Old Covenant age of Israel, that arrived in AD 70.